Harvard University Press, 9780674066755, 366pp. The economic growth of South Korea has been a remarkable success story. After the Korean War, the country was one of the poorest economies on the planet; by the twenty-first century, it had become a middle-income country, a member of the Organization of Economic Cooperation and Development (the club of advanced economies), and home to some of the world's leading industrial corporations. And yet, many Koreans are less than satisfied with their country's economic performance, given the continuing financial volatility and sluggish growth since the Korean economic crisis of 1997-1998. 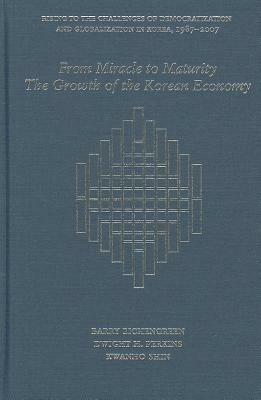 From Miracle to Maturity offers a comprehensive qualitative and quantitative analysis of the growth of the Korean economy, starting with the aggregate sources of growth (growth of the labor force, the stock of capital, and productivity) and then delving deeper into the roles played by structural change, exports, foreign investment, and financial development. The authors provide a detailed examination of the question of whether the Korean economy is now underperforming and ask, if so, what can be done to solve the problem.